"She went to Paris to start over, to make art instead of being made into it." A sweeping debut set in Paris in the 1930's about the love story between Vogue model turned photographer Lee Miller and the artist Man Ray. Little, Brown and Company is one of the country’s oldest and most distinguished publishing houses. Led by publisher Reagan Arthur, Little, Brown brings out fiction and nonfiction by many of America’s finest writers in hardcover, paperback, ebook, and audio formats. Michael Pietsch is the Chairman and CEO of the Hachette Book Group, of which Little, Brown is a division. Terry Adams, Digital and Paperback Publisher, oversees Little, Brown’s paperback lines, including Back Bay books and Little, Brown trade and mass market paperbacks, as well as Little, Brown’s electronic publishing program. Judy Clain is Little Brown's Editor in Chief and Craig Young is its Deputy Publisher. Little, Brown and Company was founded in Boston in 1837, when Charles Little and James Brown formed a partnership “for the purpose of Publishing, Importing and Selling Books.” The company was primarily a bookseller at first, as were most publishing firms of that day, and has in fact traced its roots back even further – to 1784 and a bookstore opened on Marlborough Street by Ebenezer Battelle. 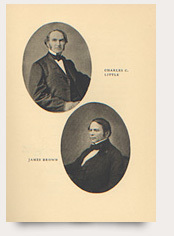 Mr. Little and Mr. Brown began by publishing the works of Benjamin Franklin and George Washington, and highlights of their early lists include Edward Gibbon’s Decline and Fall of the Roman Empire, The Letters of John Adams, the speeches of Daniel Webster, and Oliver Wendell Holmes Jr.’s landmark The Common Law. In 1859 the company took over publishing rights to a book entitled Familiar Quotations by John Bartlett. The eighteenth edition of the now familiar Bartlett’s Familiar Quotations, with Geoffrey O’Brien as General Editor, arrived in 2012. To this day, Little, Brown remains committed to publishing fiction of the highest quality and nonfiction of lasting significance. The company’s bestselling novelists include J.D. Salinger, Herman Wouk, James Patterson, Anita Shreve, Michael Connelly, Alice Sebold, Janet Fitch, Pete Hamill, Emma Donoghue, David Foster Wallace, Kate Atkinson, Stephenie Meyer and Elin Hilderbrand. In its early days, Little, Brown published Little Women and Little Men by Louisa May Alcott, Man Without a Country by Edward Everett Hale, and the poetry of Emily Dickinson. Over the years it has brought out important novels by Norman Mailer, Thomas Pynchon, Gore Vidal, Evelyn Waugh, John Fowles, Thomas Berger, Erich Maria Remarque, James Carroll, Richard Yates, John P. Marquand, Ellery Queen, Ngaio Marsh, C.S. Forester, John Barth, and Rick Moody.